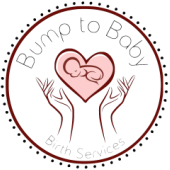 Bump to Baby Birth Services - Welcome! Welcome to Bump to Baby Birth Services, where all aspects of your birth - physical, informational, and emotional - are cherished, honored, and respected. Let me help you feel empowered and positive about this next beautiful chapter so you can have your best birth possible! Whether it's at home, hospital, a birthing center, naturally, vaginally, baby #1 or baby #10, with a surrogate, with or without a partner, a planned cesarean birth or a VBAC, your birth can greatly benefit from a doula and evidence agrees. I would love to meet with and talk to you. Servicing Denton, Dallas, Fort Worth and other local North Texas cities.